Electrodermal Activity in Psychological Research summarizes the methodological problems involved in the application of electrodermal activity as a dependent variable to basic psychophysiological research. The approach of this nine-chapter book is generally from the molecular to the molar in sequence of chapters, from basic to applied research, and from the more elementary to the more complex independent variable manipulation. 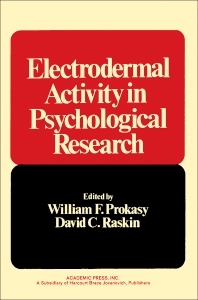 This book covers first the terminology, recording and measuring techniques, electronic circuits, and current theories of the physiological mechanisms of electrodermal responding. The following chapters deal with the theories of attention and arousal; the indices of electrodermal activity and their relationships to these theories; the problems of measurement and control; and the effects of various independent variable manipulation on simple and differential conditioning performance. The discussions then shift to instrumental conditioning of electrodermal activity and the use of electrodermal measures in research on personality and pathological states, such as with schizophrenics, retardates, depressives, psychotherapy, central nervous system damage, anxiety, and introversion-extroversion. This text further considers the presumed mechanisms underlying systematic desensitization and the relationship of these mechanisms to electrodermal activity. A chapter explores the several widely divergent areas of social psychological research where electrodermal activity has been applied as a dependent variable, including in attitude, empathy, small groups, and social interactions. The concluding chapter evaluates the scientific basis for the application of electrodermal measures to deception detection field. VI. Summary: What Can Be Inferred from Measures of Electrodermal Activity?